The Starbuzz Enterprise hookah Stem is proudly made in the USA of surgical grade stainless steel and space grade aluminum metals. This American Made shisha pipe stem is a game changer, as the surgical grade stainless steel down tube is completely resistant to ghosting, keeping flavors pure in between flavor changes with no scrubbing action necessary. Starbuzz brand narguile pipes boast a five year limited warranty as each part of the Hookah stem is machine compressed to ensure lock tight seals and perfect finishes. Starbuzz USA Made Hookahs feature heavy duty anodizing, as the paint finish will not corrode with water, heat, and normal everyday use. Experience the future of Hookah pipes which are proudly made in the United States for your Hookah smoking pleasure. 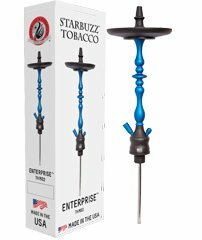 Starbuzz USA hookahs are sold only as a stem and tray set. Hookah Set includes The Base, Hose, Bowl, Tongs, Grommets, and other standard hookah accessories are not included. Hookah Set contains The Base, Hose, Bowl, Tongs, Grommets, and other standard Hookah Accessories are not included. If you have any questions about this product by Starbuzz USA Made Hookahs, contact us by completing and submitting the form below. If you are looking for a specif part number, please include it with your message. VAPOR HOOKAHS TIMBER 29” COMPLETE HOOKAH SET: Portable Hookahs with single hose capability only. This shisha pipe has a black tinted glass vase, a wooden stem, and matching wooden hose handle.